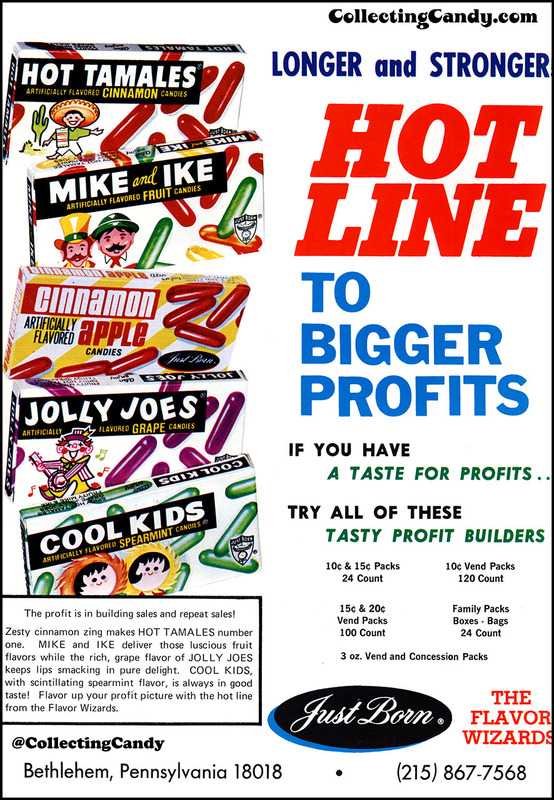 ← Bazooka’s Big Buddy – A “Big Stick” Bubblegum History 1968-1984! While most folks do their 2017 “year in review” type editorials in December or January, mine tend to slip to February and in the case of this year and last, the month of March. 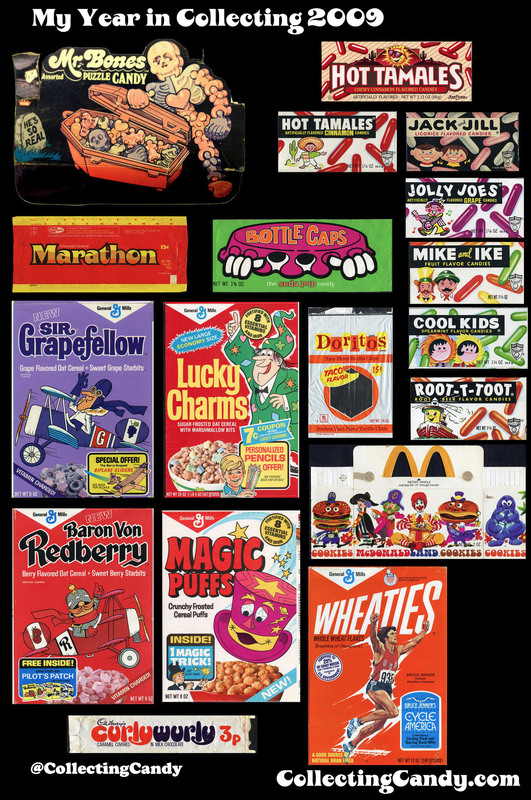 Even so, I’m wonderfully-excited to share the highlights from my previous collecting year, having created a colorful retrospective collage of extra-groovy pieces I’ve added to my archives over the previous twelve months. Make the jump to check it out! 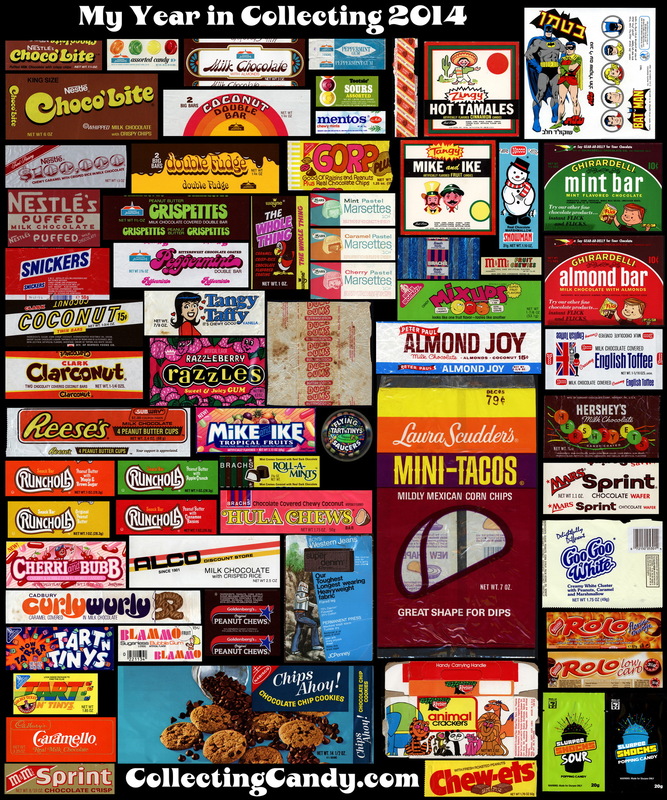 I first started doing these retrospective collages eight years ago, when I initially looked back at my “2009 year in collecting”. Back then, I was sharing them on the Flickr image sharing site. 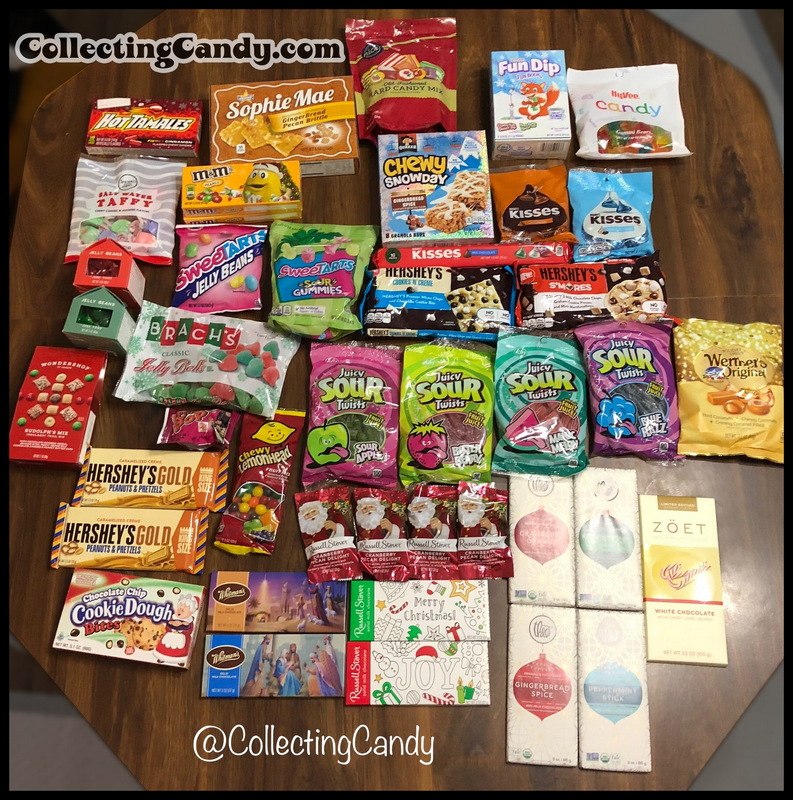 It would be a couple more years before CollectingCandy.com would launch in February 2012 (becoming the new home to most of my collection-related content sharing), and these year-end articles would become one of my favorite traditions and posts I looked forward to assembling each year. These retrospective posts showcase what are, to my eye, some of the neatest pieces I’ve picked up during the previous twelve months. 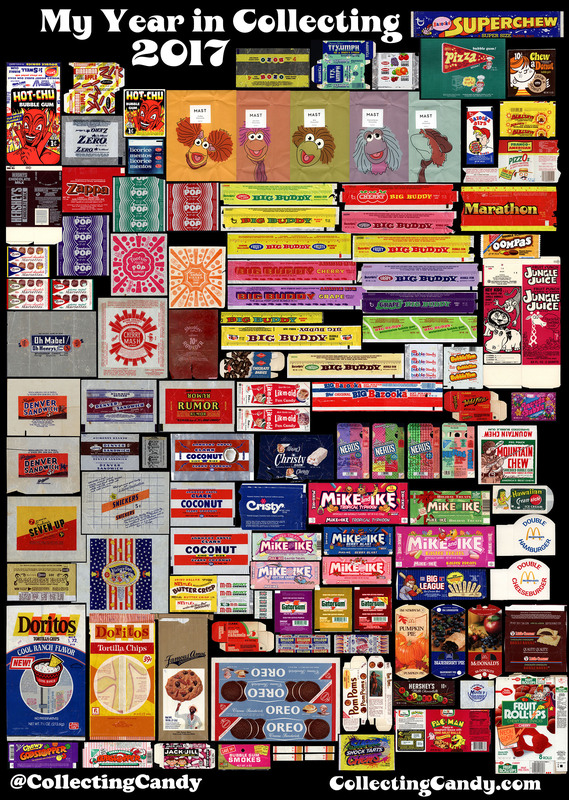 Typically, they’re comprised of vintage confectionery packaging pieces I’ve been hunting for, for years. 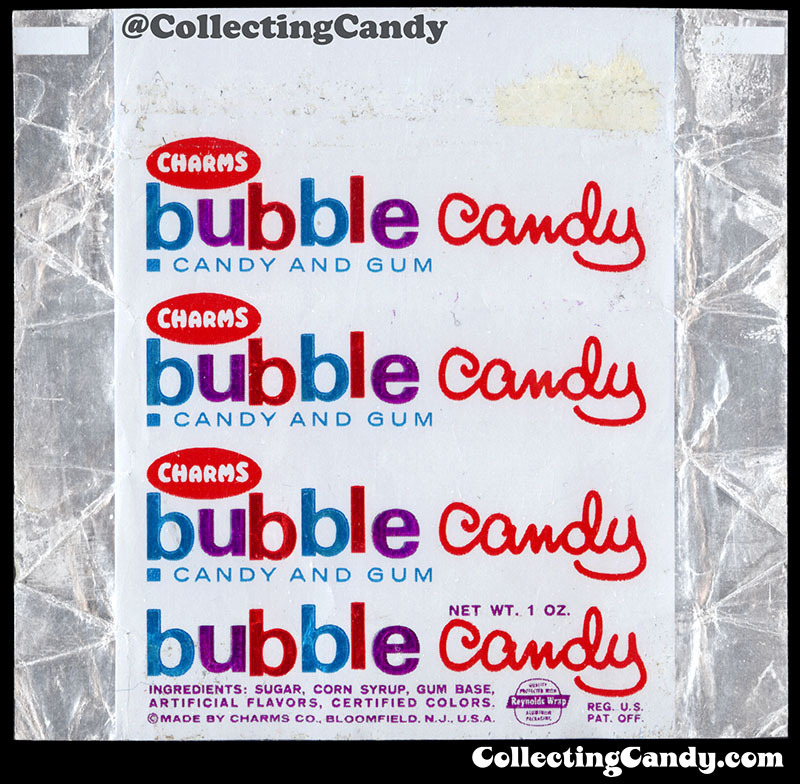 But sometimes they’re an item I never knew existed or in rare cases something I picked up new at retail. 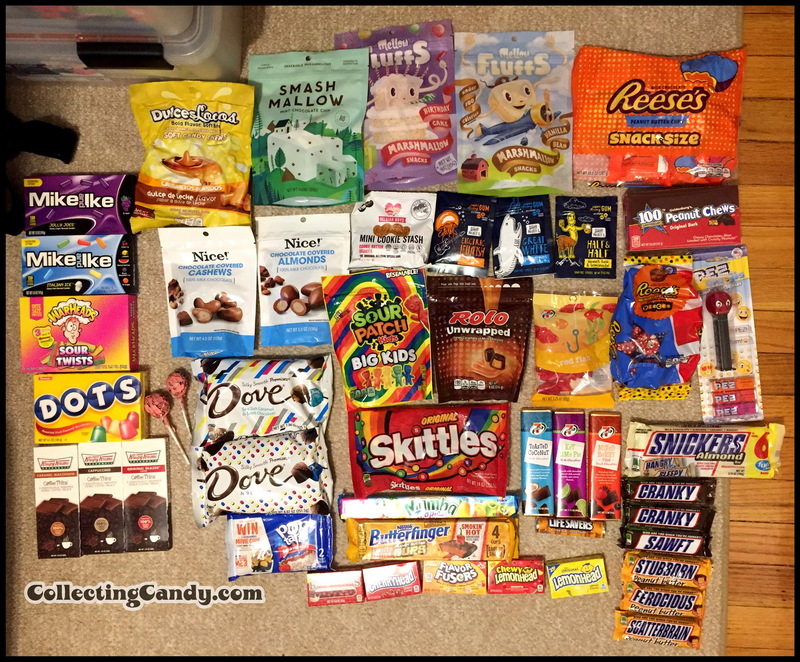 And there are also always a few non-candy packaging pieces that make their way onto the list as well. 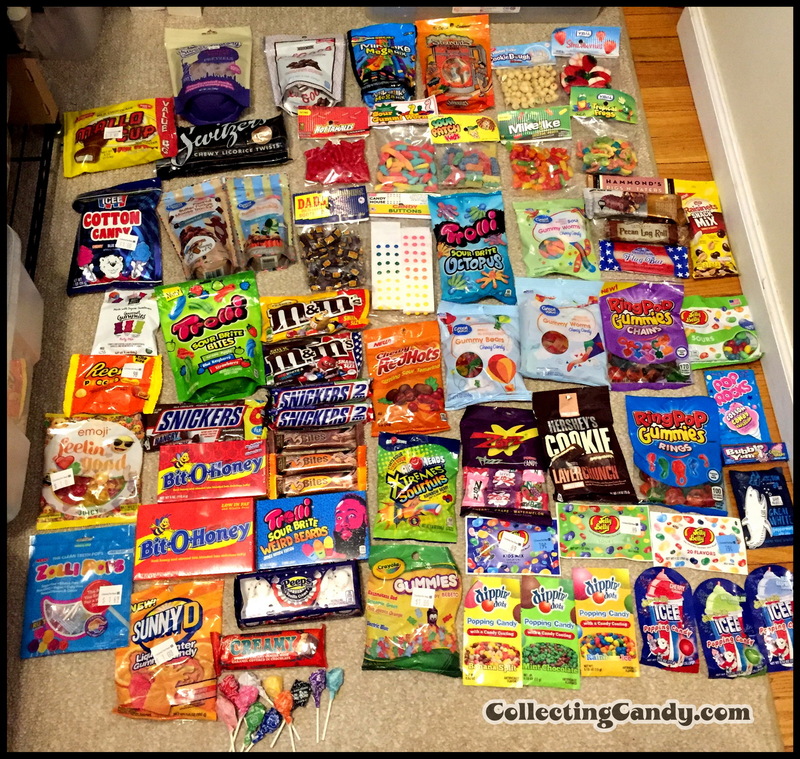 My year in collecting is so much more than just these highlights of sought-after pieces, so this year I’ll also be sharing some of my “new candy shopping haul” photos from 2017, as I believe they convey an image of how intense, challenging and fun it can be just keeping up with “the new stuff”. Because while I’m all about the history and the vintage material, I’m also committed to tracking the new history as it is created. I think you’ll dig their inclusion this year. In addition, I’m going to share a clip from the television show project I hosted and helped create this past year, as it was a huge part of my 2017 and it is something I’m immensely proud of. And without further ado, here is my Year in Collecting, 2017 edition! 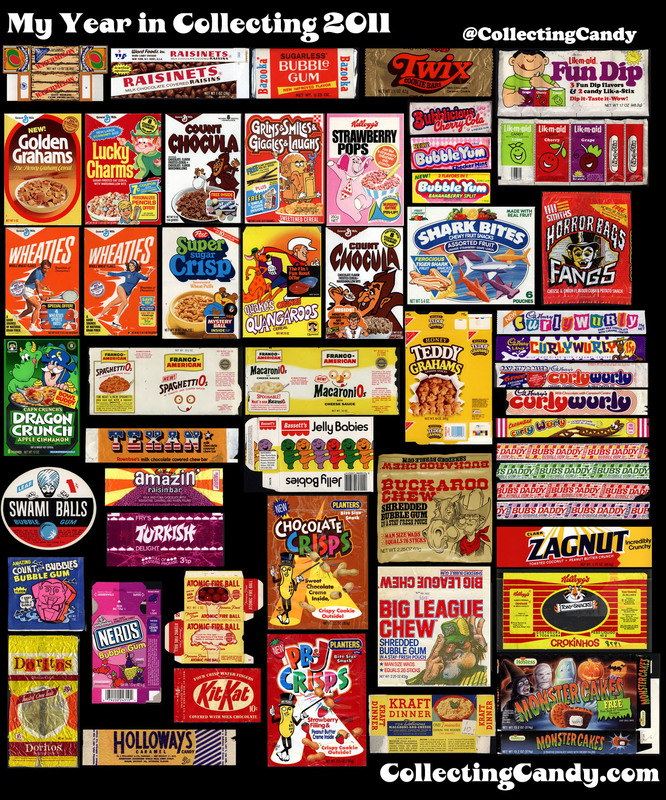 Reflecting on these special pieces from 2017, I feel that it was weighted more on pre-war wrappers than my typical retrospectives have been, and I can’t point to exactly why that is. I think it was just that a number of finds containing them showed up out in the world during the year, so there were more opportunities to acquire pieces from that era. 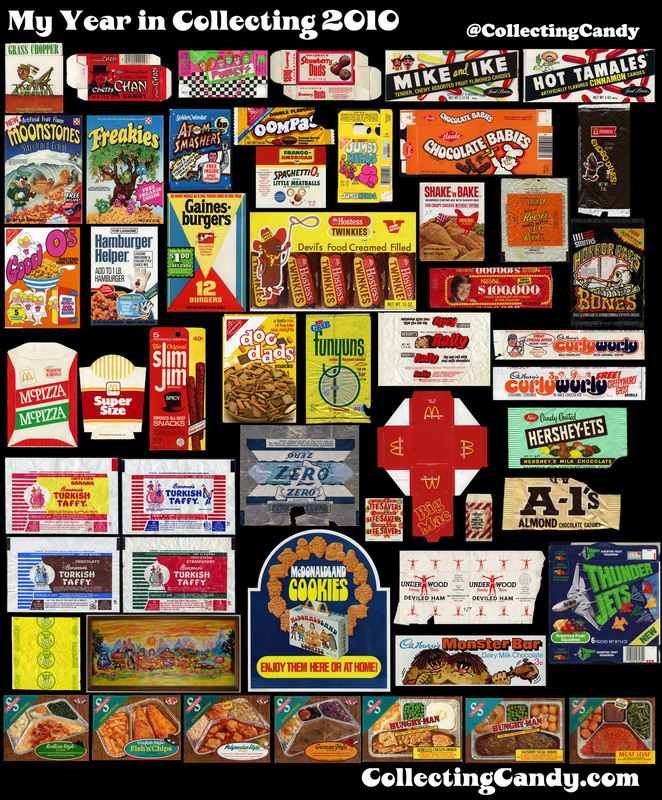 With many older pieces showing up, it was great to flesh out some of the Denver Sandwich brand packaging history this past year – there are four different wrappers represented in the collage, each one from a different period in the brand’s ownership evolution [Patterson-Branford, Redel’s, Sperry and Pearson’s]. 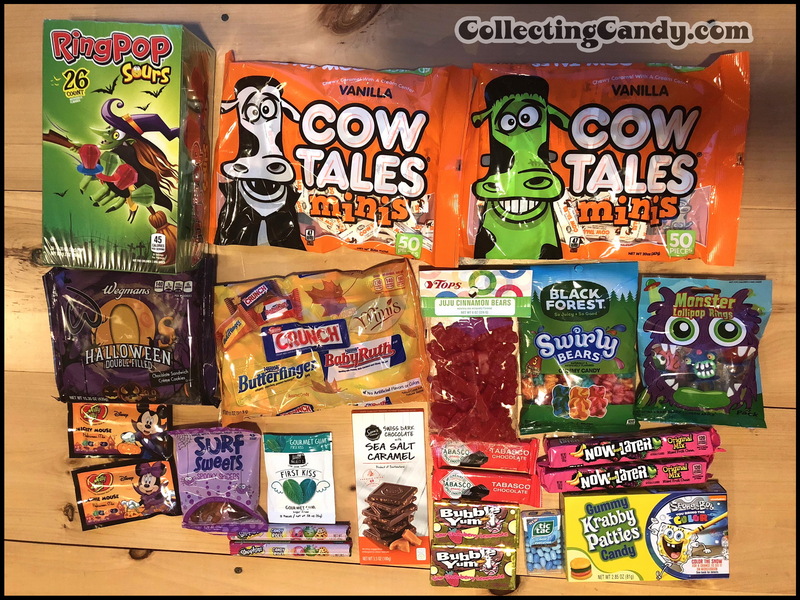 On the more recent side of things, I was thrilled to finally acquire a set of the 10th Anniversary Wonka Nerds boxes, and some of the late 1990’s Mike and Ike flavor boxes that had, until now, proved very tough to track down. 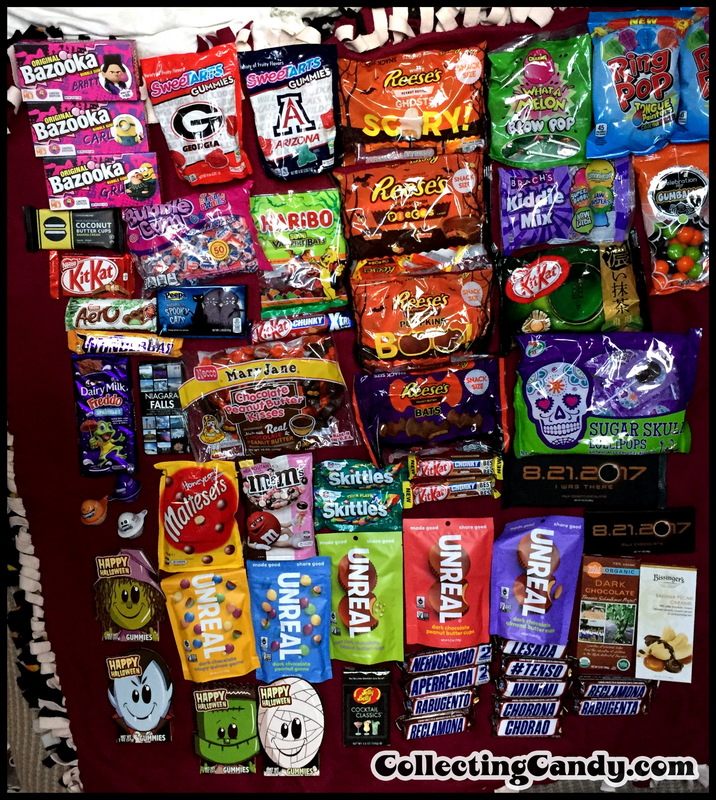 As I alluded to earlier, I’ve even included a group of wrappers that were new in 2017. 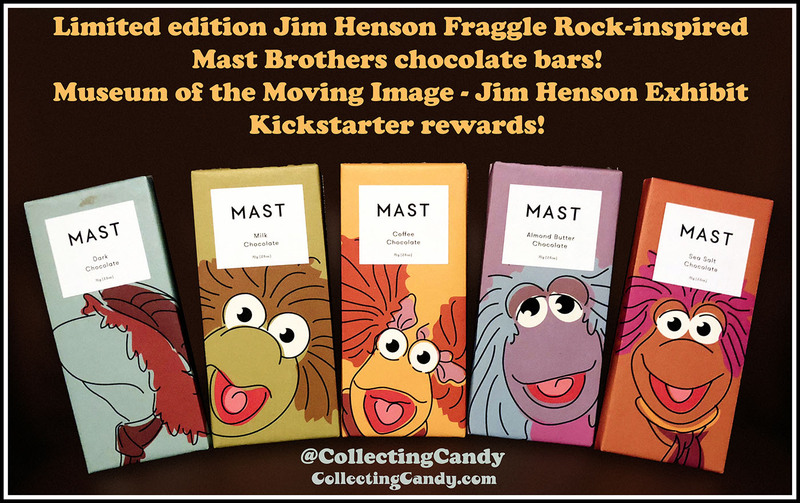 Those are the Mast Brothers chocolate bars inspired by Jim Henson’s Fraggle Rock characters – created as backer rewards for the Kickstarter campaign supporting the Jim Henson exhibit at the Museum of the Moving Image, right here in Queens in New York City! There is a story behind every one of the pieces represented in this year’s post. 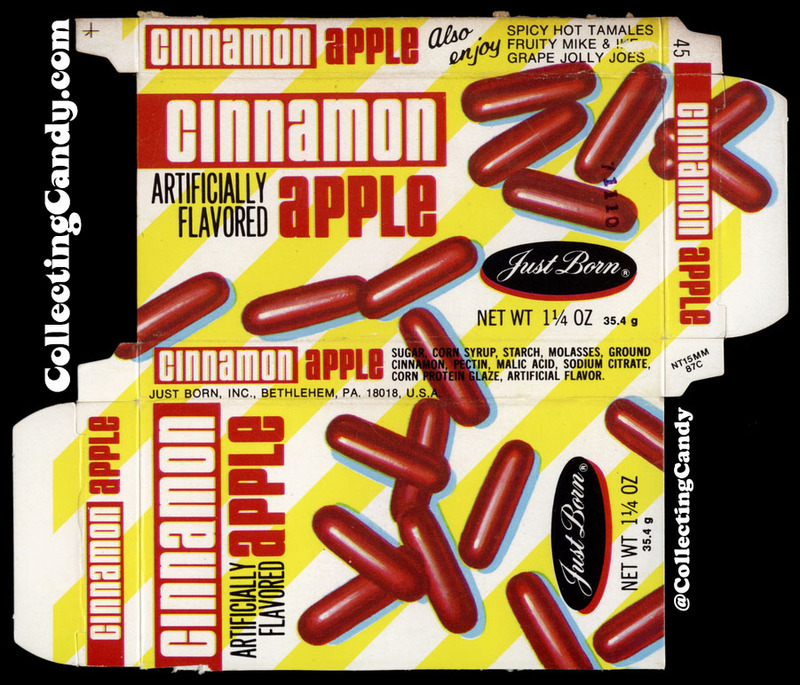 But perhaps the greatest single acquisition (and my favorite story) for my collection in 2017 was for an item I’d been searching for since I first learned of its existence just six years ago, a box for Just Born’s “Cinnamon Apple” from 1979. 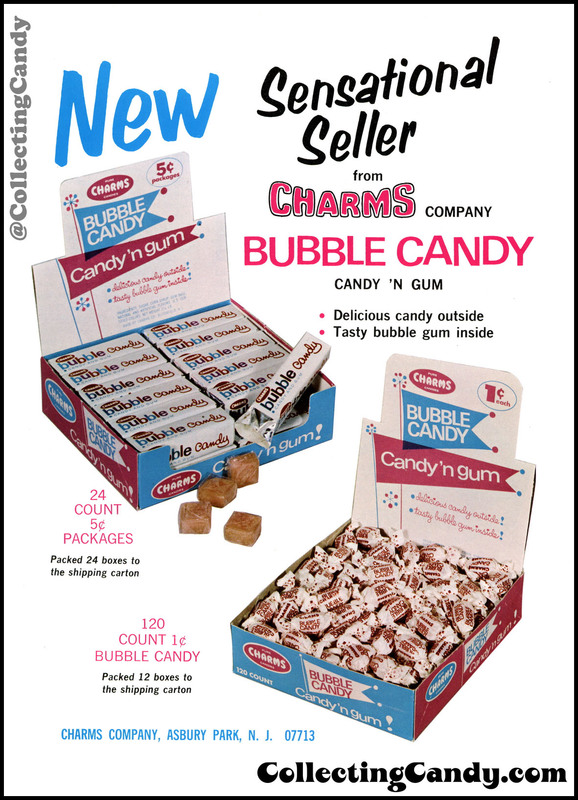 That Cinnamon Apple box may not have the nostalgic or obvious visual appeal of many of the other things I’ve shared today, but to me it is the find of the year – a “white whale” I’d been actively seeking for nearly six years and one that I presumed I might never find an example of. It doesn’t get much better than that. 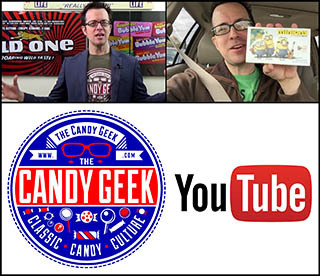 2017 was also the year where a lifelong dream and personal ambition of mine connected to all of this fun stuff was realized in the form of getting to host my own TV show. I’ll be sharing more of the details about that at another time but for now here’s a five minute highlight clip of what I helped bring to TV screens across America in 2017! Hooray! That show was a tremendous joy to make, and I aim to do more of that kind of work in the future. So stay tuned for more on that! 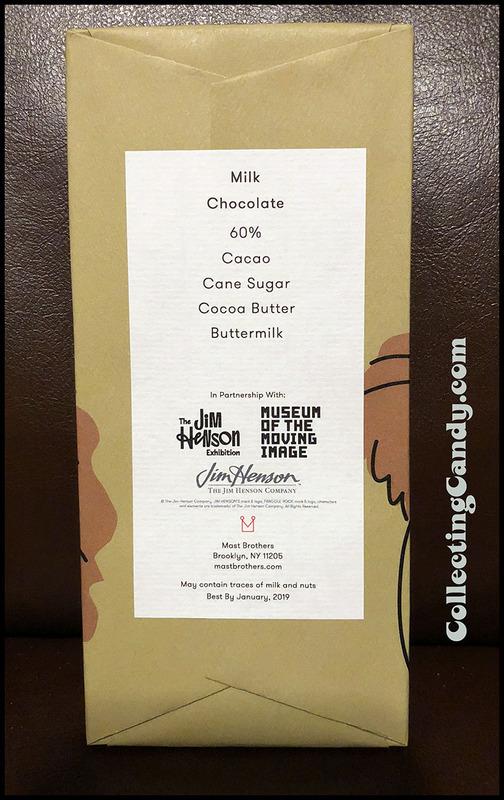 Next up is a look at all of the previous “Year in Collecting” retrospectives I’ve done in ascending chronological order from my very first edition covering 2009. 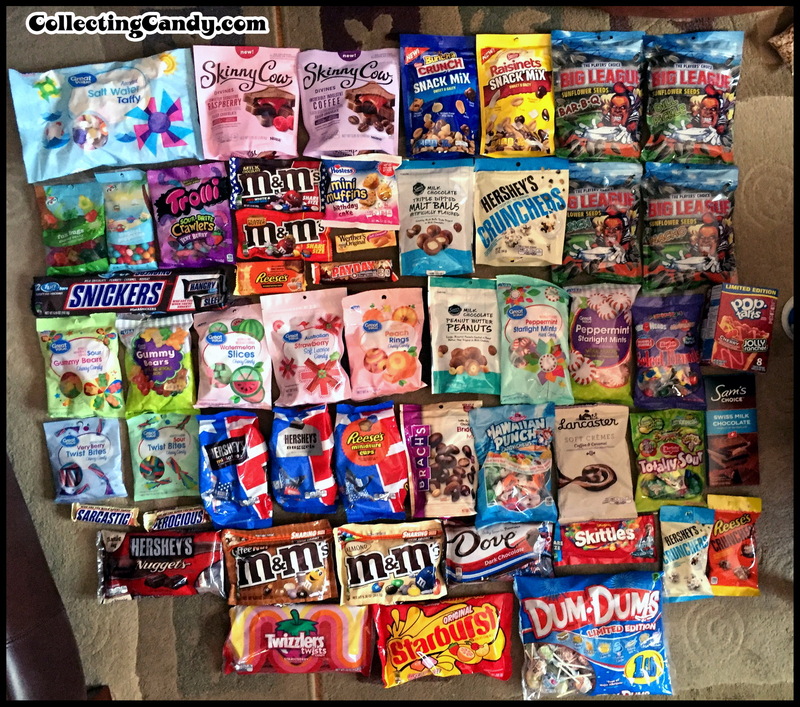 Following these, I will be sharing a selection of photos from some of my largest (and in some cases most ridiculous) “new candy shopping hauls” from the 2017 calendar year. I never tire of looking back at those colorful collages. Every one of them contains so many stories from the years in question. Some of those stories are about the pieces themselves, but many more are tales about the people who brought them to me or that I acquired them from and so forth. 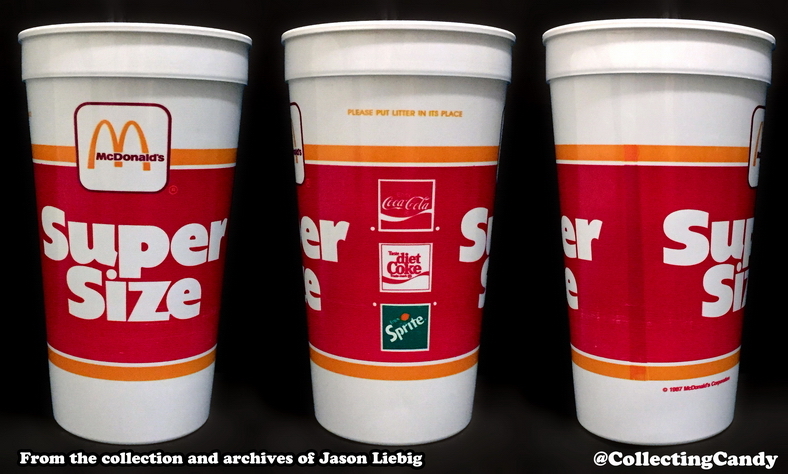 Investigating and documenting the history of this genre of pop culture consumer packaging and branding can sometimes be a solitary endeavor. 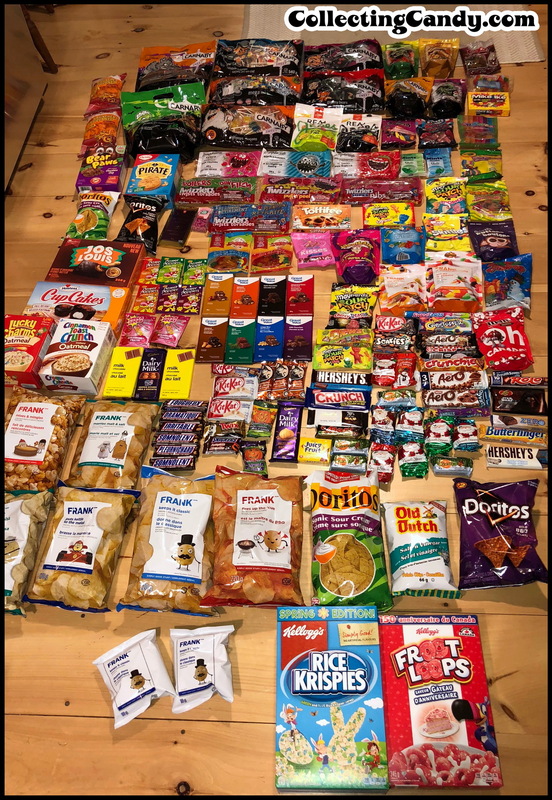 There are many hours of scanning, photographing, sorting and cross referencing and so on – all largely done by myself surrounded by my archives and materials here in my office. But the whole endeavor is most satisfying when it puts me in touch with people outside of my humble world. 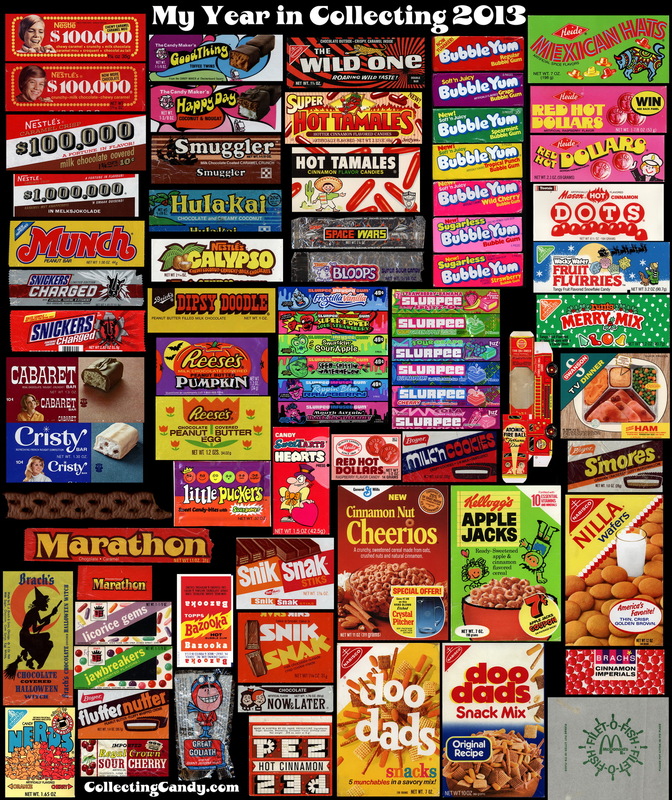 Sharing stories of saving wrappers or discovering them, of helping someone understand a brand, connecting with a fellow collector, or reminding someone of a childhood favorite – it’s about the interactions and the people as much if not more so than it is about the physical items themselves. 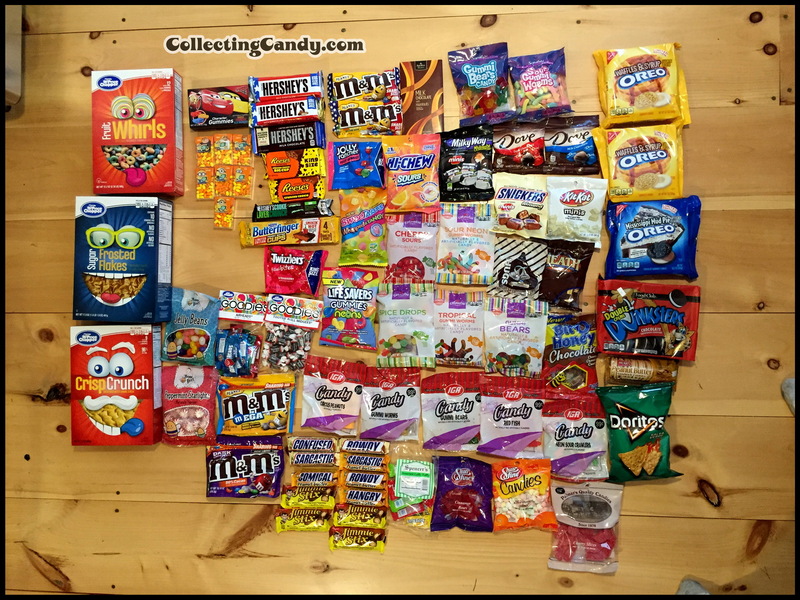 So with that, I’m going to close out this year’s edition of “My Year in Collecting” with the new addition to this year’s post – a look at “the new stuff”. 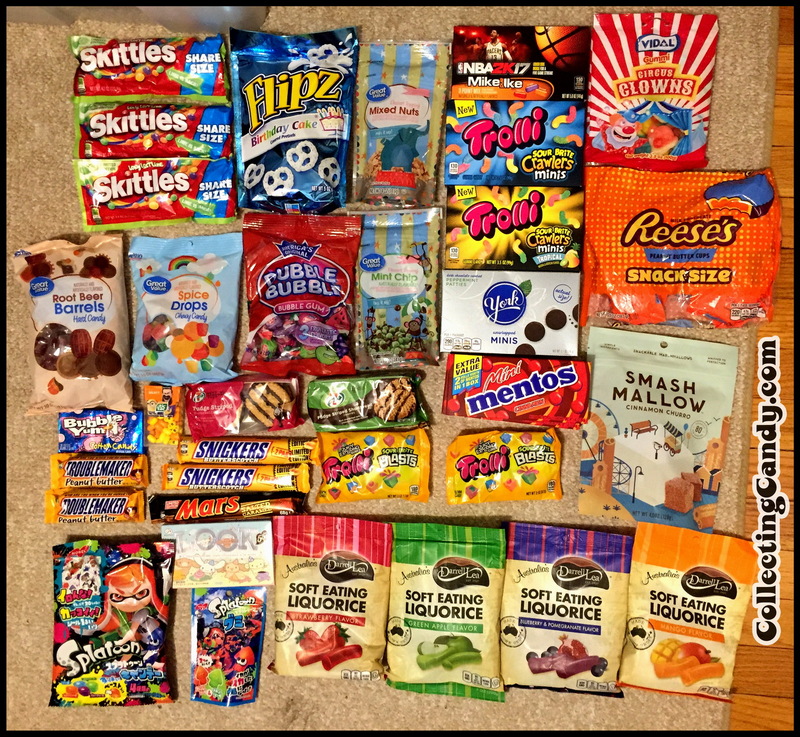 Below I’ll be sharing a selection of some of the myriad confectionery pieces I’ve picked up new at retail in 2017. 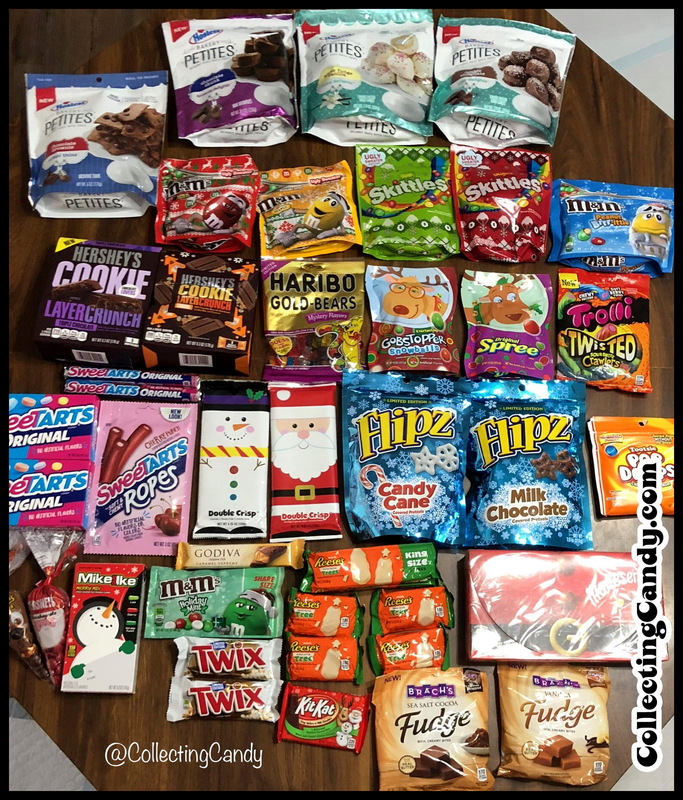 Going out and getting the new stuff at retail is a fun way to keep up with the new confectionery history as it is being created even if it can get… a little crazy at times. But I think it’s all “crazy in a good way”. 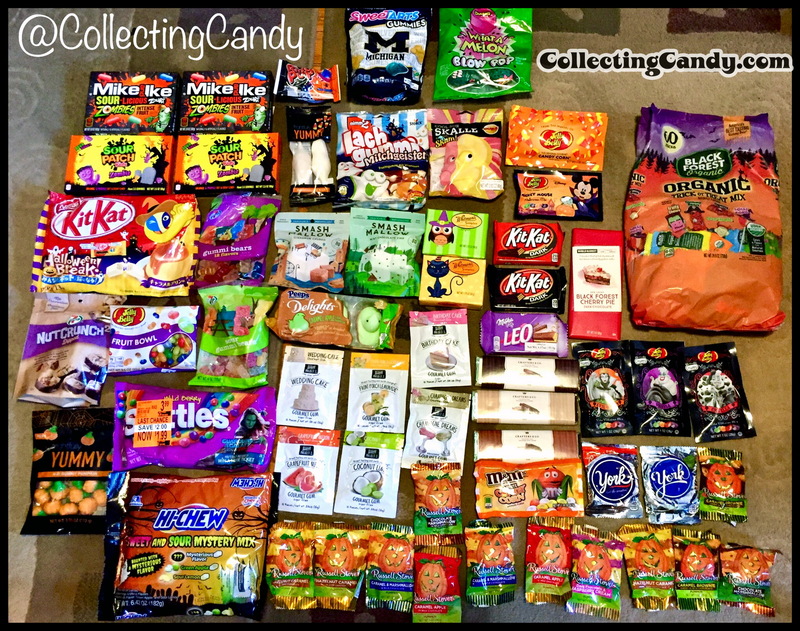 So here are some of my best 2017 candy shopping hauls!!! It’s all a bit of wonderful colorful madness, don’t you think? But as crazy as it might seem by looking at those photos, it’s also tremendous fun and all of it combined has led to some wonderful adventures and many new friendships along the way. 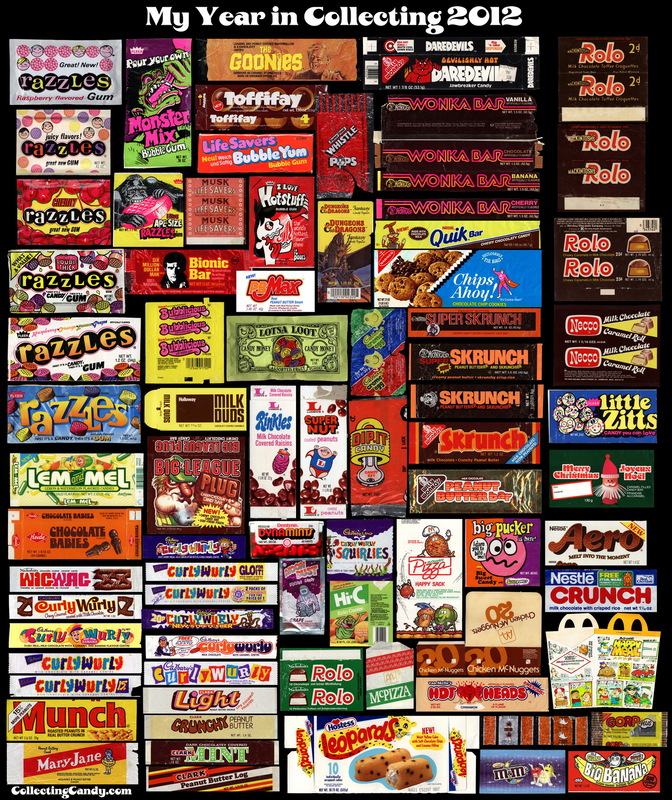 So I wouldn’t trade in my brand of pop-cultural-confectionery madness for anything. 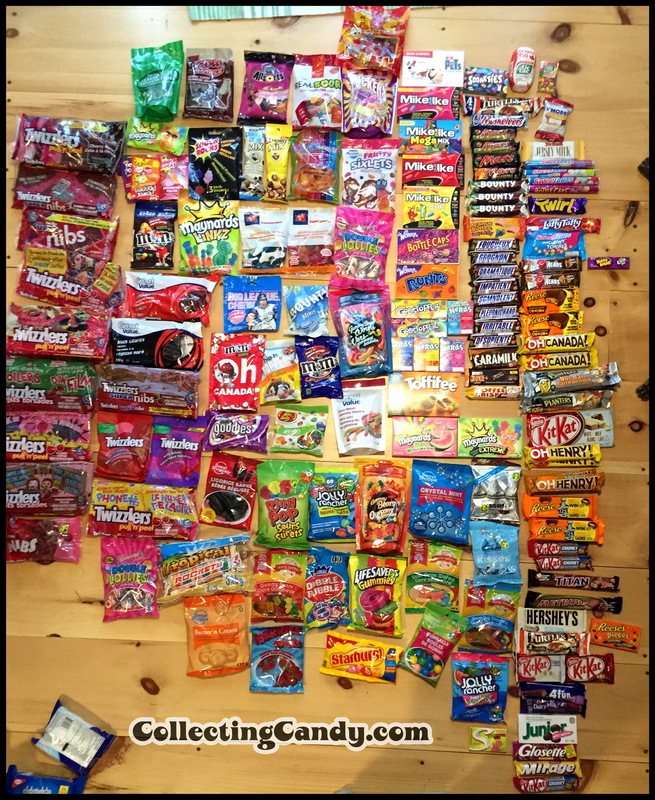 And that is everything I’ve got to share from my “2017 Year in Collecting!” What an amazing year it was… but I’d best get back to work on my 2018! So goodbye for now and I will see you next time!! 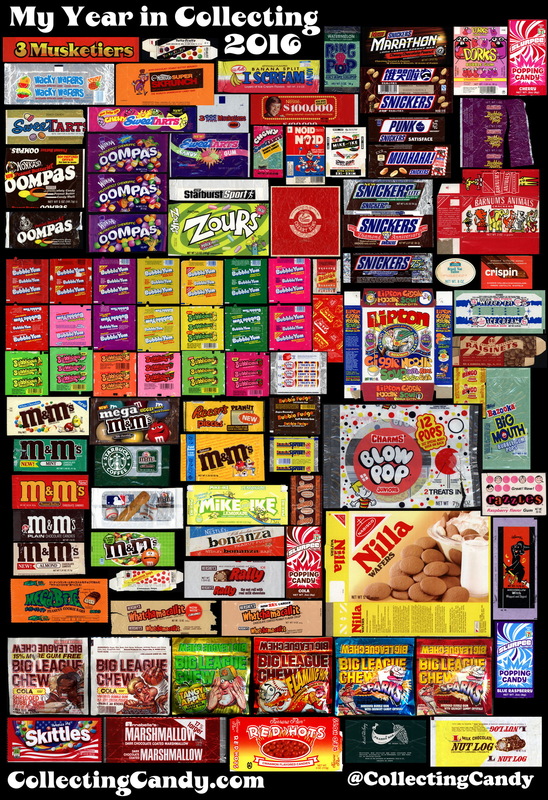 This entry was posted in 1950's, 1960's, 1970's, 1980's, 1990's, Boxed, Canadian, Chocolate, Christmas, Easter, Fleer, Gum, Gummies, Halloween, Hard Candy, Hershey, Holiday, M&M's, Mars, Nestle, Reese's, Sour Candy, Timeline, Topps, Wonka and tagged candy collecting, candy collection, candy collector, candy shopping haul, candy wrapper collection, candy wrapper collector, collectible, collecting candy, confectionery, confections, haul, junkfood haul, packaging, packaging design, shopping haul, sweets, vintage candy wrappers, wrapper. Bookmark the permalink. 7 Responses to My Year in Collecting: 2017! Heads up to those who want a closer look at the pics. Right click, “View image” then right click to zoom in. 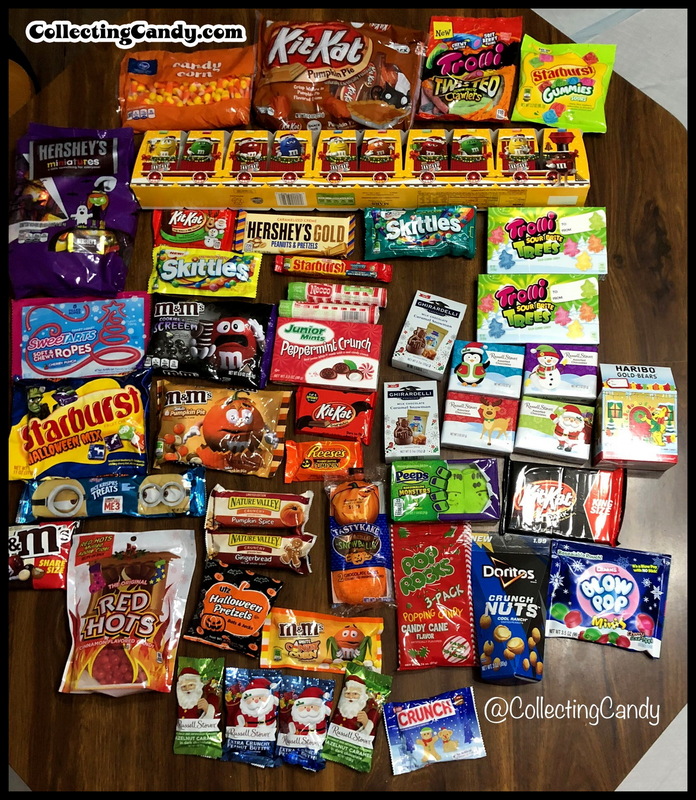 Congrats on another stellar year — and thanks for sharing your collection with us! Cool. What should I do with my original MM when they went black and white. I kept double sealed bags. A masterful selection of items. 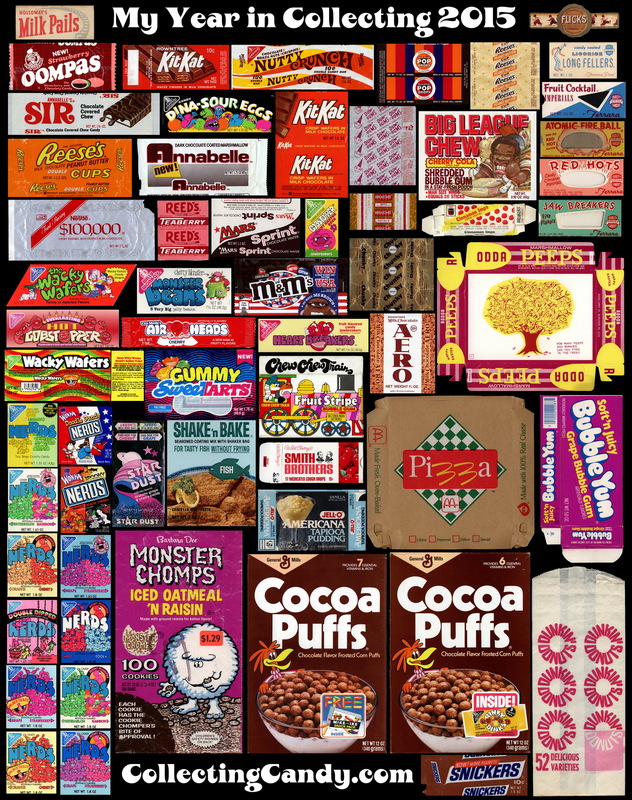 Some of the candy and cereal I enjoyed years ago, others I am trying to find for my own collection. In one year you found both Sir Grapefellow and Baron von Redberry? Whew! Thanks, Charles! That was a very good year, indeed. I hope you continue to add new posts. 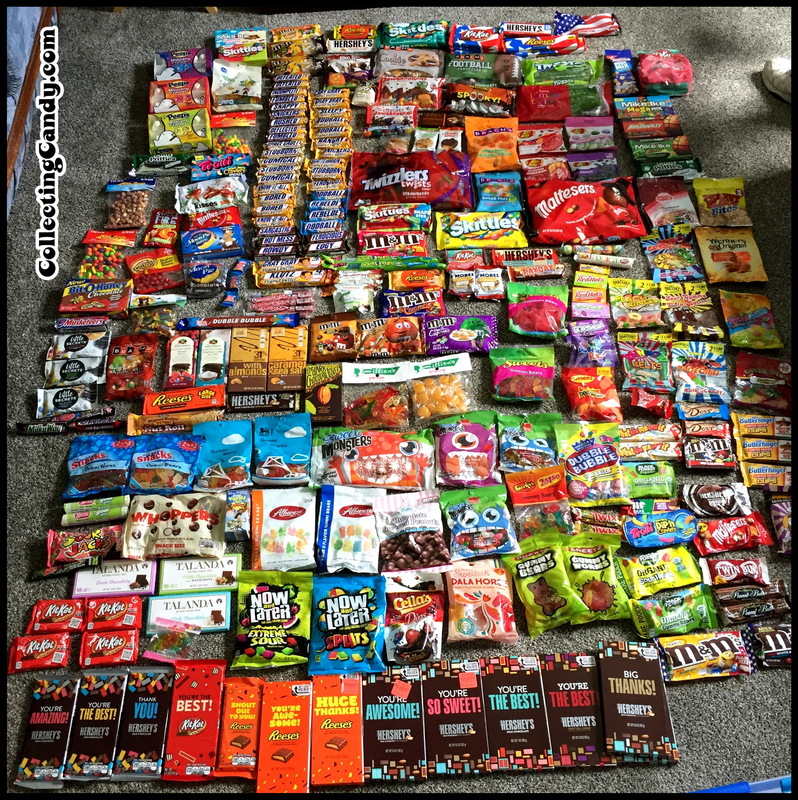 I look forward to reading what you are up to in candy collecting. I am still fascinated by it, and have started looking on ebay to see what is out there. Maybe I will start collecting!